Canton: Loraine Ann Rebillard, age 62, passed away on Monday, December 4th, 2017 peacefully surrounded by her family. Born in Winsted, CT, December 22, 1954, she was the daughter of the late Genevieve (Zecchin) and Harvey Rebillard. 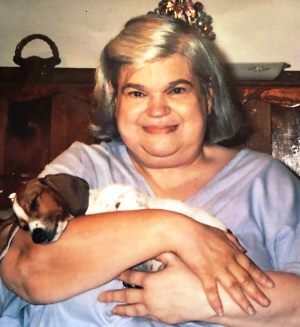 Loraine was an employee of LARC Industries for over 15 years, and competed as a swimmer in the Special Olympics. An avid bingo player with a contagious sense of humor, she always made those around her laugh. She loved dancing, Liked listening to country music, she enjoy drawing and painting with water colors. She loved spending time with family, especially the 4-legged members, Cooper, Penny, Molly and Pixie. She is survived by her aunt and longtime caregiver, Veronica Zecchin, her cousins Jamie Coligan, Karen (Coligan), Darcy, Hillary & Hannah Davis and all the staff at Cherry Brook Health Care Center, her home for the past 3 years. Special thanks to the McLean Hospice team for the care they provided the entire family. She was predeceased by her aunt and uncle Inez E. (Zecchin) and James Coligan, also her caregivers. A private service and burial will be held at the convenience of the family. Memorial donations may be made to the Special Olympics in memory of Loraine. To leave an online condolence, please visit www.maloneyfuneral.com.